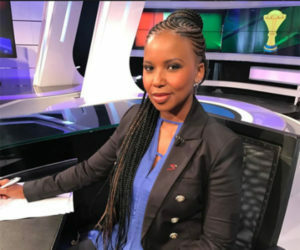 Carol Tshabalala is a popular South African sports broadcaster, producer and voice-over artist working for SuperSport International. She was born in the year 1981 in Pimville located in Soweto, South Africa. Tshabalala is currently a freelance reporter and live studio anchor at the Barclays Premier League Football Today Live Shows. Carol got married to Solomon Manana while she was aged 19 years and together they both had two sons namely Joel and Solomon. Joel was born in 2002 while Solomon born in 2007. Carol Tshabalala got divorced in December 2006 while she was pregnant with her 2nd son Solomon. After graduating from Krugersdorp High School in 2000, she became a sportscaster for SABC. Until 2011, she worked as a voice-over artist, television anchor, and a programme director. In 2005, she joined Kaya FM 95.9 for about 2 years as a sports news reporter, where she dealt with compiled and reported news on the breakfast show. 2008, she joined Radio 2000 as a drive-time sports show host, while working as a sportscaster for SABC, until 2013. In 2011, she left SABC having spent 10 years and joined SuperSport. Tshabalala said one of her reasons for leaving was because she felt she was not used to her fullest at SABC. Her minor role during the 2010 FIFA World Cup coverage bothered her because it showed that the channel didn’t have enough confidence in her to consider her for such a grand event. In June 2016, Carol Tshabalala joined Barclays Premier League Productions (IMG productions) as a live studio anchor. In January 2017, she co-hosted SuperSport’s 10-year celebration. In 2002 she became the first female sports anchor of a major TV sports show. She is the first and the only African to host the FIFA Ballon d’Or. In 2016, she joined Premier League and became the only African based presenter at English Premier League sportscasters and among the few women presenters.